Their most famous track is God in an Alcove, from the In the Flat Field CD. Many remixes of this song exist, but it is best in its original form, from the original CD. 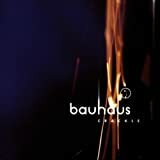 Bauhaus are the founding fathers of goth rock, creating a minimalistic, overbearingly gloomy style of post-punk rock driven by jagged guitar chords and cold, distant synthesizers. this 1998 compilation makes it onto vinyl. The tracks have been re-sequenced for the format and there's a special substitution of an unreleased hybrid mix of "Bela Lugosi's Dead" featuring a 1982 studio vocal over a live backing track. The two disc set is packaged in a gatefold sleeve and, with under 20 minutes playing time per side, the cut is loud with minimum compression.